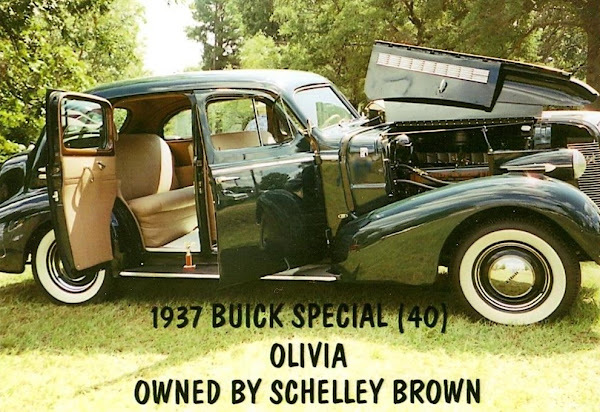 On The Road With Schelley Brown Francis: Sometimes A Louisiana Road Trip Ends Up In Texas! Sometimes A Louisiana Road Trip Ends Up In Texas! 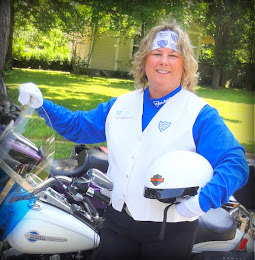 I often travel Hwy 80 and all the other back roads of Louisiana, especially if I am driving an antique car or riding with my significant other on his Harley-Davidson. Because w e live so close to the Louisiana-Texas line, we often find ourselves in Jefferson, Texas; for a quick get away. It’s only a little over an hour from home and it is very appealing for us to take off at the spur of the moment just to spend the night or just eat lunch and walk around shopping. 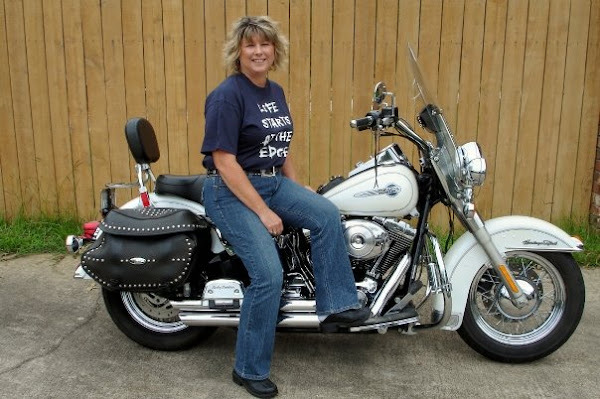 The drive and or ride is always great! 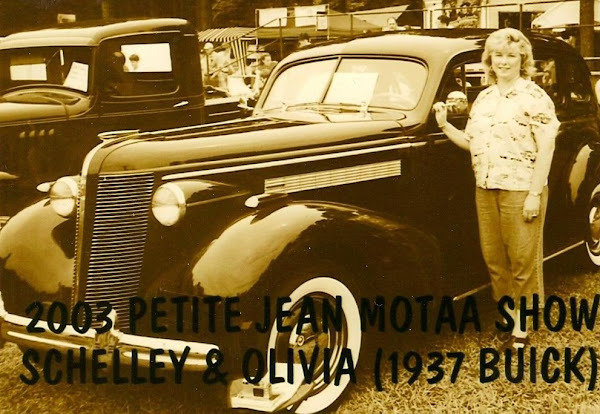 Several years ago when I was planning Vintage Vacations for Shreveport car clubs, our first trip was to Jefferson. 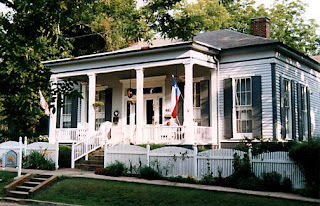 This is where we first meet the owners and operators of the Alley-McKay House Bed and Breakfast located at 306 East Delta Street in Jefferson, Texas. Hugh, Darla and son Atticus Har per Lee (Darla’s favorite book is “To Kill a Mockingbird”) are always happy to see us. Their hospitality is warm and so is their baking. Homemade cookies and pies usually fresh out of the oven are waiting for the next overnight guest to walk through the door every Friday. One of our favorite parts about the Mckay House, which you don’t want to miss, is the huge 9 a.m. breakfast! This is where you get to meet the other guest; it is always a treat to share stories at the breakfast table about your adventures the night before! Maybe a ghost story or two will surface or maybe a little karaoke excursion will be revealed from someone’s night at the local pub and restaurant “Auntie Skinners”. 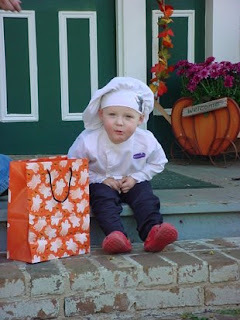 I will first give you a little history of the home. 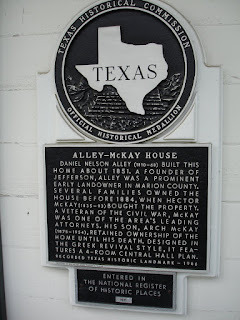 The Alley-Mckay House was built in 1851 by Daniel Alley, one of Jefferson’s founders, as his own home. The original house was built in a Greek Revival style, with a wide central hallway an two rooms on either side. The kit chen was a separate building, connected by a breezeway which was later enclosed as a porch area and then expanded to be the main dinning room. 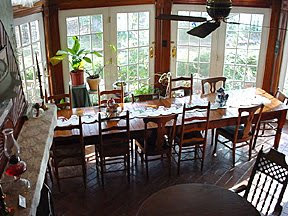 The original part of the main house features the original cypress wood floors, installed when the house was built. Each of the four original rooms has a fireplace; during Daniel Alley’s time, they were coal burning fireplaces, but hey have since been converted to gas. The light fixtures hanging in the central hallway once operated on gas; they have been converted to electricity, but still retain the necessary pieces for gas. The house was purchased by Captain Hector McKay in 1868. This family, descendants , or relatives owned the house for the next century. The McKay house was fully restored during the late 1980’s and now bears national and state historical markers. During the early 1990’s a Victorian style addition was added. The addition was built with material salvaged from Victorian-era homes around Texas which were scheduled for demolition. The gables came from a home near Waco which was built around 1880 and the stairwell from a home in Bryan. The house has seen such famous visitors as former First Lady, Lady Bird Johnson; Alex Haley, the author of Roots; and Martin Jurow, director of films such as “Breakfast at Tiffany’s.” It is also reputed to house supernatural inhabitants as well. The ghosts of a man and a woman associated with the house in Waco have been seen on the staircase and in the upstairs rooms. Also, the spirit of a lady seems to be responsible for such things as moving tools across rooms and mischievously ringing doorbells. Outside is one of favorite places to stay at the McKay house and that is the cottage. If you are traveling with another couple ask for the cottage. The cottage across the English style gardens is not the original carriage house. The building which stands today is slightly larger than the original, but is from the same time period, and one of the tow wood burning fireplaces stand where a fireplace once stood in the original building. I like the rustic room of the cottage, myself. 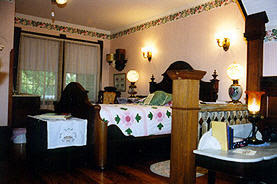 In April of 2002, the McKay House was purchased by the current owner, and inn- keeper, Mr. V. H ugh Lewis II. Hugh. Hugh is a pleasure to do business with and always so helpful in telling you what see and do once you get to Jefferson. And believe me, there is always something going on in Jefferson, Texas. 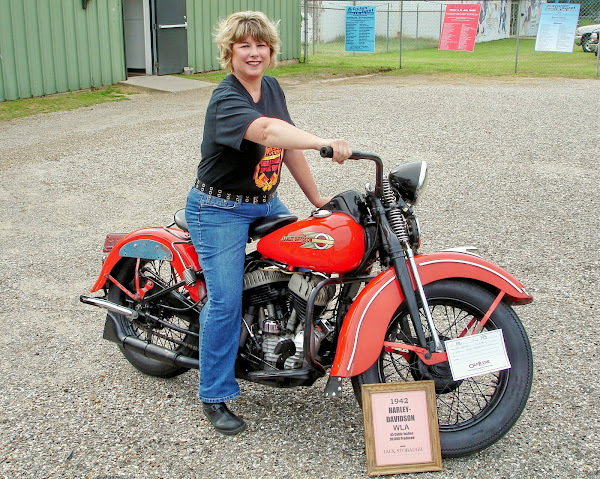 Car shows, motorcycle shows, river boat or train rides, tours of historic homes, riding in horse drawn carriages, visiting the wonderful Jefferson General Store is a step back in time, battle reenactments, plays, parades, and fireworks are just a small sample of what you can do in Jefferson once you get there. 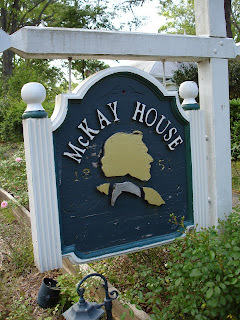 For more information on the McKay house visit the web site at http://www.mckayhouse.com/ or call 903-665-7322 Cell 903-240-9049. 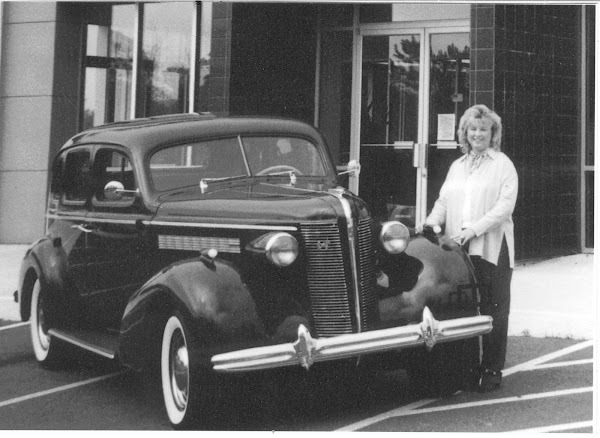 For Reservations, please call Classic Inns Reservations at 800-468-2627 you can email Hugh and Darla at innkeeper@mckayhouse.com . So until next time keep it between the ditches and tell your mama-an-em hello for me!